For ither uises, see Charleroi (disambiguation). 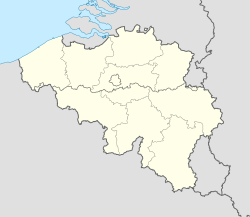 Charleroi (French pronunciation: ​[ʃaʁləʁwa], Walloon: Tchålerwè) is a ceety an a municipality o Wallonie, locatit in the province o Hainaut, Belgium. Bi 1 Januar 2008, the tot population o Charleroi wis 201,593. The metropolitan aurie, includin the ooter commuter zone, covers an aurie o 1,462 square kilometres (564 sq mi) wi a tot population o 522,522 bi 1 Januar 2008, rankin it as the 5t maist populous in Belgium efter Brussels, Antwerp, Liège an Ghent. The indwallers are cried Carolorégiens or simply Carolos. ↑ 2.0 2.1 Statistics Belgium; Population de droit par commune au 1 janvier 2008 (excel-file) Population o aw municipalities in Belgium, as o 1 Januar 2008. Retrievit on 2008-10-19. ↑ Statistics Belgium; De Belgische Stadsgewesten 2001 (pdf-file) Definitions o metropolitan auries in Belgium. The metropolitan aurie o Charleroi is dividit intae three levels. First, the central agglomeration (agglomeratie) wi 288,549 inhabitants (2008-01-01). Addin the closest surroondins (banlieue or suburbs), the total o 405,236. An, wi the ooter commuter zone (forensenwoonzone), the population is 522,522. Retrievit on 2008-10-19. Wikimedia Commons haes media relatit tae Charleroi. This page wis last eeditit on 29 Juin 2017, at 17:14.